The high level of deference shown so far by the members of the Indigenous People of Biafra to the elders of Ohaneze Ndi Igbo group and to the five South-East governors for sometimes now when an order came from the IPOB leadership requesting that no form of aspersion should be used to address Ohaneze Ndi Igbo and their co-conspirators - the five South-East governors is something that the duo should not see as an act of cowardice nor desperation in order for them to politicize IPOB with their Nigeria politics of more you look, less you see. The said meeting became a jamboree and a charade of dance of shame when it was observed and noted that the core reason[s] for which Ohaneze Ndi Igbo group and the five states Igbo governors of shame called IPOB and her leadership for a meeting was to champion the course of Nigeria election come 2019; the wanton in character elders and the Igbo governors wants to force IPOB and her leadership to embrace Nigeria politics where they forgot so quick that they instigated the Nigeria government of Mohammadu Buhari who killed IPOB members in en mass and got their leader - Mazi Nnamdi Kanu together with his parents kidnapped for the sole purpose of murdering them in cold blood without publicity stunts on them and their whereabouts. We have observed with keen knowledge and make out to say that IPOB is not here to trade their future and that of their unborn generations for Nigeria politics, we have also seen the witticisms in Ohaneze Ndi Igbo group and the five South-East governors of shame to trade the future of Biafrans in a general context for peanuts; Ohaneze Ndi Igbo refuse to tell the public who invited the Nigerian military to pillage our land causing the lotic rivers to flow with blood of their children; Ohaneze Ndi Igbo are the proverbial vulture that merry and make feast out of their kind for the sole purpose of aggrandizement. 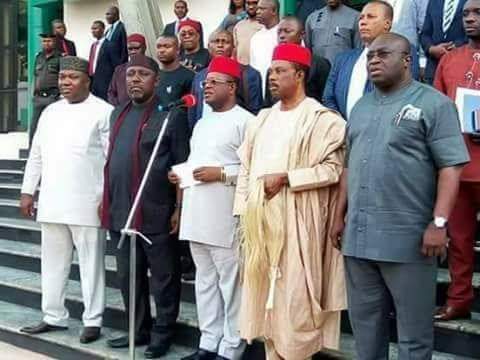 It is shame on the side of Ohaneze Ndi Igbo that called themselves elders of reputable characters not to listen to the cries of their children in need of freedom of purpose; we are not exempting the inglorious five South-East governors as they are not exceptional, they were the first set of criminals that proscribed the activities of IPOB in their various states thereby created an avenue that gave way for a murderous Nigerian military operation code-named - Python dance I & II. It will be better that we use this opportunity to educate the unsuspecting public and the half-baked educated elders together with their governors that IPOB is not their business cart. Before you prescribe an organization there must be well articulated "prima facie" exhibits to be tendered before any court of competent jurisdiction that such an organization have cells where they indoctrinate their members to disrupt public peace either by killing people en masse using lethal and sophisticated weaponry, maiming, kidnapping, using improvise devices to cause mayhem, wanton in characters and operate out of stipulated laws within local and international laws; such things were not traceable to the activities of IPOB and the Nigerian government proscribed them through the instrumentality of Ohaneze Ndi Igbo and the South-East governors that made it possible. Shame to Ohaneze Ndi Igbo and the irredeemable house slaves in the capacity of governors that refused to de-proscribed what their inglorious acts did and here in secrecy canvassing, begging IPOB to step up with their game and help bring out a candidate for the vice presidential slot under PDP come 2019; the Indigenous People of Biafra are not here for gaming purpose with Nigeria politics, first before any other meaningful discussion if there would be any in the nearest future is for Ohaneze Ndi Igbo with their co- murderers to produce Mazi Nnamdi Kanu and parents, de-proscribe IPOB as there's no basis for such prescription. Ohaneze Ndi Igbo and the five South-East governors failed to enunciate to IPOB and her leadership what the activities of Fulani herdsmen are to the country and why the government who is to prescribe them is looking the other way round; Ohaneze Ndi Igbo and the South-East governors failed in their capacity to elucidate to IPOB and her leadership between the Fulani herdsmen and the members of the Indigenous People of Biafra who has contravened stipulated laws and authorities. On the referendum, we anchor our last hope, not in Nigeria politics.